Thursday, 24 January 2019, 6:52a.m. Last year Microsoft blurred the lines between laptop and tablet so much it now really makes no difference - the Surface has evolved into a device so powerful and functional it's just a question of which form factor you prefer. 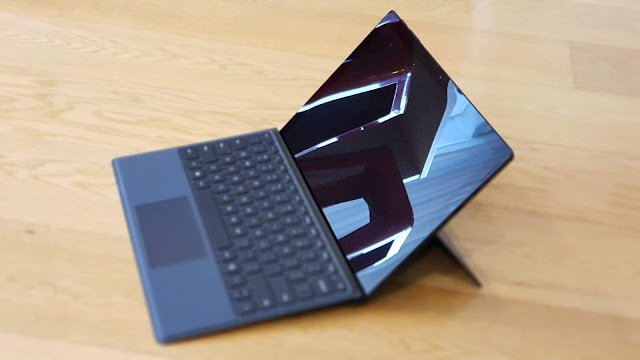 Incorporating the latest i5 or i7 Intel processor, 8GB or 16GB of RAM and anywhere from 128GB to 1TB of storage, there can now be no doubt the Microsoft Surface is an extremely powerful computing tool with very few design compromises for the sake of extreme portability. The only physical features the Surface Pro 6 really gives up (other than a full-sized keyboard with dedicated number pad, obviously) is all the ports. Oh, there are still enough; a mini display port, headphone jack, microSD slot... but somewhat controversially, there's a single full-size USB 3.0 slot, rather than a smaller, faster USB Type-C slot you'll find on most other new-release compact tablets and laptops. I suppose it is strange for Microsoft's very latest not to offer the latest connection option, but personally, if I had to choose between the two, I'd take a full-sized USB slot any day. Sure transfer speeds might be a little slower, which may be an issue if you're regularly swapping large files between devices, but just about everything I want to plug into a computer still connects via a full-sized plug. For me, the big question mark hanging over Surface devices of the past has been battery life - head to head with an iPad, they've never come close to competing. My feeling with the Surface Pro 6 is Microsoft has made some big strides in battery tech. The website claims up to 13.5 hours of continuous local video playback - sounds impressive but presumably that's with features like bluetooth and WiFi disabled. Despite that, I've definitely noticed a marked improvement in battery life. I've been especially impressed with the lack of drain when I simply close the cover - which puts the device to sleep rather than shutting it down completely. Previously I've been disappointed to find devices like this to be almost flat when I open them the next day. Not the case anymore. The photos taken from both forward and rear-facing cameras are extraordinarily, disturbingly clear - but only if the light is good and you don't use the zoom. The zoom seems to be all digital and things get very noisy very quickly. I also found it pretty hit and miss with lighting conditions, many photos would let in far too much, over-exposing the shot, sometimes just as I was taking a photo I thought I had looking pretty good. In saying all that, the cameras on the Surface Pro 6 are some of the best I've used on any laptop or tablet - which isn't saying much because they're usually so terrible. Facial recognition via Windows Hello face sign-in worked better on this device than any other Windows machine I've ever used. Previously the angle and lighting had to be just right in order to log in just by looking at the screen - now the experience is almost as reliable as the face-unlock most high-end phones offer, although still not as fast. It's great Microsoft are getting this right as I truly hate typing in endless passwords. There are a few things that have me confused though. Why are the bezels around the screen so wide? These days it's pretty unusual for a device to not have something approaching edge-to-edge display. The Surface Pro 6 doesn't come anywhere near it - in fact I thought I had something set up wrong in the display settings because the screen seemed to be cut off so abruptly, especially at the sides. Not that there's anything wrong with the screen size; 12.3" is heaps. Perhaps it's the 3:2 aspect ratio that weirds me out so much - I definitely prefer the wider 16:9 for movie/TV viewing. Which is a shame because the screen quality is truly excellent - fantastic blacks and much less reflective glare than on previous models. The other thing that adds to a pleasurable viewing experience is the forward-facing stereo speaker array - I was truly impressed by the clarity and stereo response from these small but powerful speakers. What still irks me most about the Surface Pro is the price. The 128GB version with 8GB of RAM starts at $1549, which isn't too bad except for two major factors; 1) You can pick up a more conventional laptop with similar specs for much less and 2) that price doesn't include the Type Cover. This drives me crazy. Yes, the Type Cover is amazing. The keys are responsive, the track pad is intuitive and user friendly and the soft, felt-like material is very comfortable to use for long periods. But it's not worth another $239.95. And there's no point buying a Surface without it. That means almost $1800 for a device with less storage than many new release smart phones. Don't get me wrong, the Surface Pro 6 is great. I just can't afford one. Click here for more information and pricing on the Microsoft Surface Pro 6.